A healthy learning atmosphere is usually a result of a clean, sustainable, safe and comfortable environment. 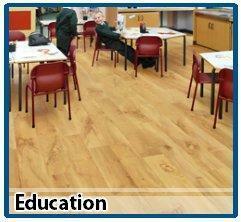 Appropriate flooring is one of the important components in any educational structure. Flooring requirements for schools and universities that involve libraries, study halls, classroom and theater rooms often demand a reduced footfall noise characteristic that allows a quieter learning atmosphere and high levels of student concentration and retention. Some schools and university floors also require low maintenance qualities, anti-microbial and non-slip properties that are applicable for hallways, locker rooms, labs and dining rooms. High Performance Solutions, Inc.is a trusted name in providing appropriate flooring installations for schools and universities in the Philippines. HPS offers a sound-absorbing and high quality flooring products of different designs that gives sustainable benefits to educational spaces and facilities.